Russian and Syrian officials maintained Wednesday their chorus of denials of any involvement in an attack on a humanitarian aid convoy near Aleppo earlier this week that has prompted a suspension of all U.N. aid to Syria. But survivors and emergency responders insist the 31-truck convoy came under a 20-missile barrage and that shelling and missiles launched either from warplanes or helicopters continued for two hours. Eyewitness accounts include testimony from the brother of the Syrian Arab Red Crescent official overseeing the convoy. Ali Barakat, also an aid worker, said he threw himself to the ground when the first missile hit, killing his bother, Omar Barakat, a father of nine. Only hours before, Omar had completed the complicated paperwork and complex negotiations with rebels and the government to allow the convoy to move from a government-controlled district in the western half of Aleppo city to the rebel-held countryside. Barakat told new agencies that more than 20 missiles hit the convoy Monday night in the small town of Uram al-Kubra. The International Committee of the Red Cross said 20 civilians were killed in an attack Russians officials claim was carried out by the rebels and not by their forces or the Syrian government’s. 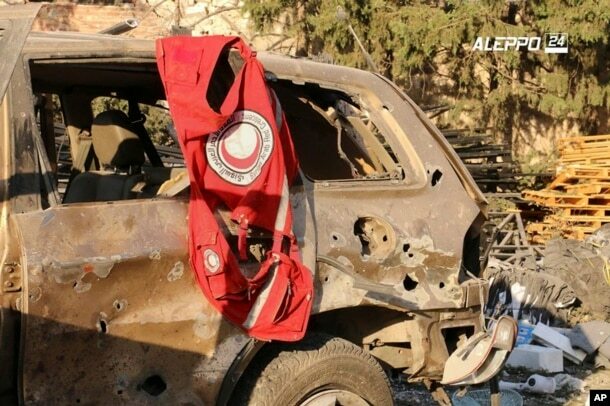 This image provided by the Syrian anti-government group Aleppo 24 news, shows a vest of the Syrian Arab Red Crescent hanging on a damaged vehicle, in Aleppo, Syria, Sept. 20, 2016. U.S. officials have told reporters in Washington that two Russian Sukhoi SU-24 warplanes were in the sky above the aid convoy at the precise time it was struck. The Russian foreign ministry rejected the U.S. claim with “resentment and indignation.” Some Russian officials have suggested the convoy simply caught fire causing the destruction or severe damage to 18 out of the 31 trucks in the convoy. But Russian and Syrian government explanations do not tally with what bystanders and rescue workers recount of an attack that left them shocked and despaired. Hussein Badawi, who leads the Syrian Civil Defense in Uram al-Kubra, said the strikes came from helicopters and land-fired missiles. His rescue team arrived soon after the first missiles impacted and he told Reuters news agency that a bombardment was sustained for more than two hours. Purported video of the attack posted online shows panic among aid workers and first responders during the attack with several shouting immediately they were coming under an airstrike. Rebel forces have no warplanes or helicopters, a Pentagon spokesman pointed out Tuesday to reporters in Washington. “There are only three parties that fly in Syria: the coalition, the Russians and the Syrian regime. It was not the coalition. We don’t fly over Aleppo. We have no reason to. We strike only ISIS, and ISIS is not there. We would leave it to the Russians and the Syrian regime to explain their actions,” said Capt. Jeff Davis, a Pentagon spokesman. 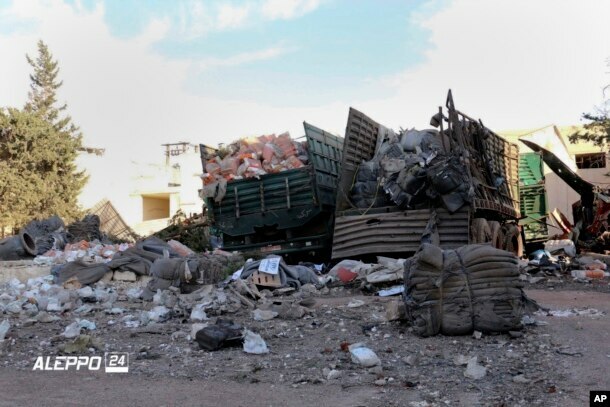 This image provided by the Syrian anti-government group Aleppo 24 news, shows damaged trucks carrying aid, in Aleppo, Syria, Sept. 20, 2016. Russia defense ministry spokesman Igor Konashenkov told the TASS news agency there was no evidence the convoy was hit by missiles. “Everything shown on the video is the direct consequence of the cargo catching fire, and this began in a strange way simultaneously with militants carrying out a massive offensive in Aleppo,” he insisted. Pictures and video from the scene, though, show crumpled trucks and buildings. And a video shared on the Internet by the Syrian Civil Defense shows not just one fire but several huge balls of fire and trucks aflame as well. Konashenkov said also only the rebels knew the location of the convoy. “All information on the whereabouts of the convoy was available only to the militants controlling these areas,” he said. 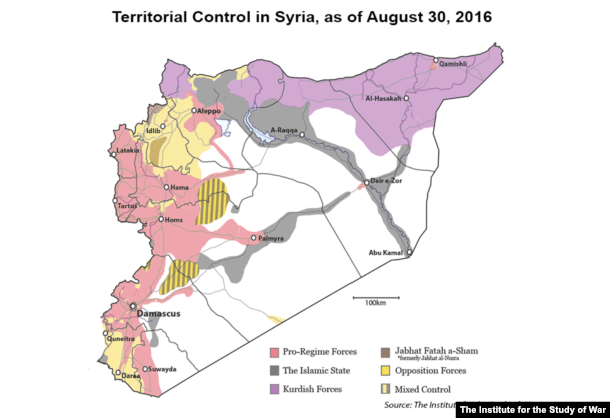 But a senior UN official in Gaziantep, Turkey, told VOA the details of the convoy’s route was known to the Syrian government, with the GPS coordinates being shared. “The names of all the drivers and officials were given to the Syrian government as well as the planned route and where loading and unloading would take place,” he said. He spoke on the condition of anonymity as he is not authorized to brief the media. He added that Syrian army soldiers observed the loading of the convoy. And clearly there was aerial monitoring of the convoy as it arrived in Uram al-Kubra — on Tuesday the Russian defense ministry released surveillance footage from a Russian drone of the convoy to show what officials claimed was a rebel vehicle alongside the aid trucks. Since the release of the footage, the Russian defense ministry said they lost track of the convoy for some time. 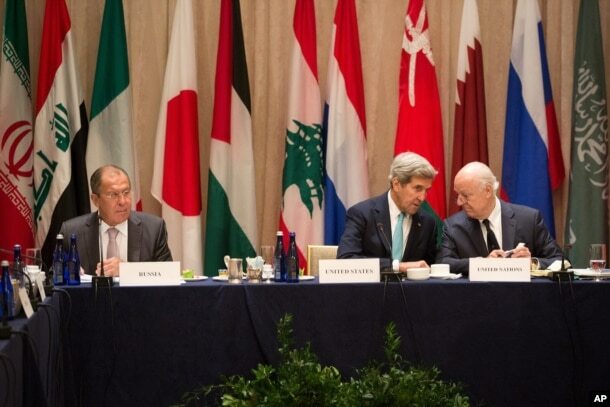 U.S. Secretary of State John Kerry (C) sits with United Nations special envoy to Syria, Staffan de Mistura (R) and Russian Foreign Minister Sergei Lavrov during a meeting of the International Syria Support Group, Sept. 20, 2016, in New York. The attack on the aid convoy will likely have major repercussions at a time the United States is trying to revive an ill-fated cease-fire that’s been short-lived and violated within days of it starting on September 12, said Western diplomats. “The cease-fire is not dead. That I can tell you,” the Swedish envoy told reporters.